..:recycled minds:..: A Future of Debt and Part-time Work? No Thanks. part-time work is not the future for me. Lately my days have been filled with working items off of my bottomless to-do list. A return to the U.S. after almost a year and half of field work finds me jobless and out of money. Perhaps this was poor planning on my part, but research funding never came through despite repeated and ongoing efforts that started over a year before my fieldwork and continued while I was in the field for almost a year. I thought my effort put into grant writing would pay off, and I was wrong. Still, my fieldwork needed to be done, or I would risk floundering around campus for who knows how many years. One colleague in my department wrote grants for 5 years before finally getting one that allowed her to do her research. For me, already pushing 40, I didn't see waiting around as a real option, especially after already delaying my fieldwork for over a year. Instead I depleted my meager savings, and went further into student debt to get out into the field and get my research done. To be fair, I did receive one small research grant that basically paid for my airfare, and while this was a big help, it was really just a drop in the bucket of costs for a long-term field project. All the while, I had to pay tuition three times per year to stay continuously enrolled, a nice budget-draining touch from the university administration. Enrollment requirements were thankfully minimal, but still amounted to around $4500 US on top of my other fieldwork expenses. To top it all off, because I was now enrolled at less than full time, the student loan companies put me into repayment and have now been harassing me. I've used deferment to get me to this point, but now the threatening repayment letters are coming in, and they want their money. Really, I'm not even sure who "they" is - through refinancing and government maneuvers on federal loans, I no longer owe the lenders. The lenders have been paid. I now owe banks and financing institutions that consolidate students' loans at lower interest rates, but benefit by being the new recipients of all the interest accruing on our unpaid loans. "The turn towards cheaper contingent labor is largely a matter of priorities rather than economic necessity. While many institutions are currently suffering budget cuts, the greatest growth in contingent appointments occurred during times of economic prosperity. Many institutions have invested heavily in facilities and technology while cutting instructional spending. Though incoming students may find finer facilities, they are also likely to find fewer full-time faculty with adequate time, professional support, and resources available for their instruction." Many people in my position attempt to get into academia by adjunct or part-time teaching. The pay isn't great, and the demands of a schedule that often includes commuting to multiple campuses, high numbers of students, and long hours without benefits, makes this move a bit less than appealing. Anyway, I've had trouble even getting these types of positions. These part-time positions are filling fast, and it's a trend that's not limited to academia. The New York Times reported on the growth of part-time positions occurring throughout the US. The wholesale and retail sector has cut over 1 million full-time positions, and added more than 500,000 part-time jobs. It's part of the latest shift that aims to streamline costs and maximize profits. Of course, this comes at the expense of the employees, who rarely earn enough to support themselves (let alone a family) on part-time salaries that have no promise of turning into more secure full-time positions. What we see here is a trend beginning to form. Organizations, whether retail businesses or institutions of higher education, continue to move in the direction of maximizing profit at the expense of the well-being of their employees. Many would argue that this is the very point of the capitalist system, and there's nothing wrong with it. Businesses "need" to turn a profit to survive, and the most successful businesses turn the most profit. However, throughout history we've exercised all types of measures to ensure that business does not turn into exploitation - at least in our own country (we've never had any problems exploiting those outside the borders for profit). Until recently, government regulations and unions had done a decent job of trying to balance the tables between business and people. That is beginning to change, with union membership (and influence) reaching a 70-year low in 2011, and the evolving approach of the business model, which continues by its nature in its search for means to increase profit. We're beginning to reach a point in which work is exploitation. Those we work for have little to no interest in our well-being, and only seek ways to manipulate our lives into profit in their pockets. So where does that leave me...? 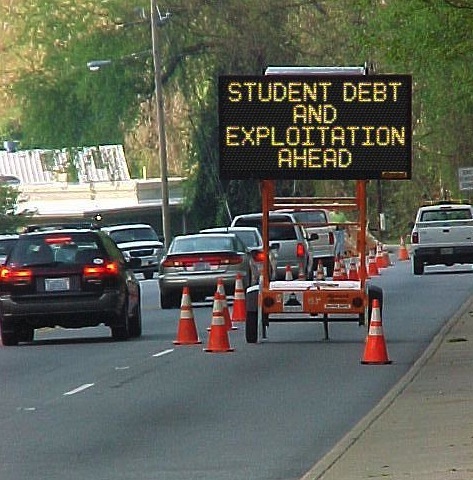 With the student-debt collectors knocking on the door, and exploitation of my self and my work as the only options, I don't even want to "work". Continuing to engage in this system only ensures that my struggles will continue indefinitely into the future. That doesn't sound like much fun - it doesn't sound like something to "work" towards. This is my life and I'm not so willing to give it away for someone else to profit on. Labels: activism, anthropology, being human, corporate issues, U.S.
and not engaging in this system ensures what exactly? This is a good question, and one that I frequently ask myself. I think that non-engagement is a form or resistance, even if it is a personal stand. By sharing some of the reasoning and/or thought process I am acting in solidarity with so many others who have been disenfranchised by this system, and who themselves are struggling to figure out how to disengage. My hope is that this contributes to a movement that is thinking about, discussing, and contributing to this process; non-engagement with one system can become engagement with another. i understand this in theory. but how does it work in practice? not working, that is. I don't see the point in giving yourself to something that you don't whole heartedly believe in just because others say you should or society expects it. How would you be better off working at target or running around to different campuses for minimum pay? You'd have some money coming in but it would all be going right to pay for accumulated debt and in the end you are in the same position minus 35 to 50 hours of your life a week.